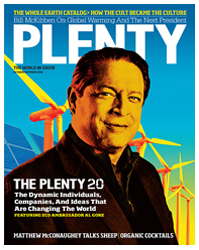 In this months issue of the environment magazine Plenty they have listed the top 20 people, 20 businesses, and 10 ideas that will "change our world". "There are game-changers and then there are world-changers. From Internet giants working to make renewable energy cheaper than coal, to a sea captain monitoring the oceanâ€™s plastic waste, to the growth of intentional communities (theyâ€™re not just for hippies anymore)â€”welcome to Plentyâ€™s second annual list honoring (in no particular order) 20 dynamic individuals and 20 pioneering companies that are bettering the planet, plus 10 innovative ideas that will revolutionize how we live." Head over to their site or purchase their latest issue to get bios and explanations on, what they call, the Plenty 20. What do you think? Have Plenty chosen the right people? And can a business really be green? Looking at these lists you cant help being humbled. How can you look down on any of them - there are sophisticated orgs and people who are pushing for good change. Initiatives are fine, but I wonder how useful it is thinking that this or that company is green. Could it be this is a result of our old TV reflex of having stars that do our thinking for us, our old habit turning off so we can feel good about ourselves as we consume.